Succulents pair well with almost any style and size container. Their forms when placed next to one another enhance their individual colors and textures all while complimenting the shape, style, color and texture of the vessel. This copper multi-branched tree limb sculpture illustrates design elements such as repetition by repeating the colors of the metal sculpture with the plants. The Rhipsalis repeats the brass soldering, the Cryptbergia 'Red Burst' repeats the warm reddish tones of the copper as do the red tips of the Gasterias. Repetition is used also by installing the same varieties of plants in more than one cavity. 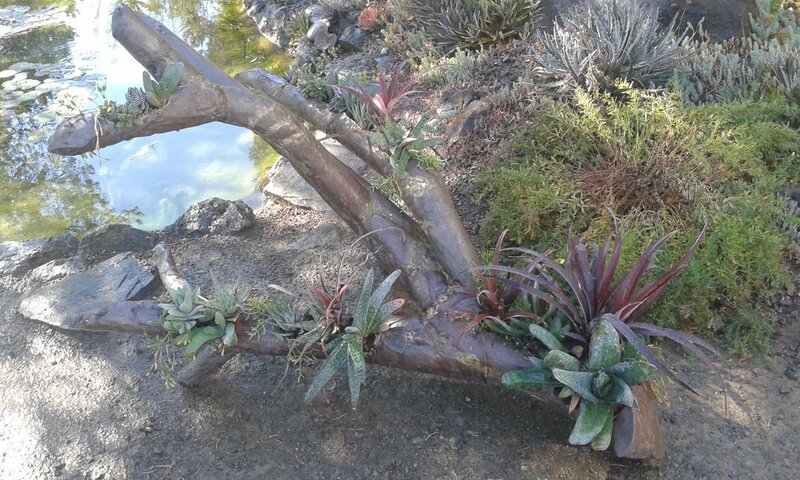 A second design element used was scale by the placing larger plants in the larger areas of the sculpture and smaller plants in the smaller areas. Notice the larger and visually heavier plants at the base of the sculpture at the bottom right serving to anchor the piece.